I remember the first time I saw a Bluetooth. It was a Motorola! I thought of it as a very high tech piece of equipment – fancy, expensive and out of my reach. Technology had consistently expanded and it went from switch board phones and rotary dial to cordless phones. Accessories were added including headsets and later, The Bluetooth. I’d finally be able to speak handsfree and the blessing was well received. After trying a few brands, coming up with my own million dollar ideas (that someone else had), I finally found a Bluetooth that worked perfectly for me. Here’s why you need a Plantronics Bluetooth in your life. At this moment, I don’t remember what prompted me to finally research getting a bluetooth. When I had seen them years before, I’m sure that price wise they felt out of my reach. As time went by, things continued to get cheaper and more accessible. Amazon is one of my favorite places to shop, especially because of the unbiased reviews online. I searched and found a bluetooth within my budget and compatible with my phone. My very first Bluetooth was a Samsung. I remember enjoying it at first for the purpose it served – handsfree bliss. The phone could be charging or just laying around anywhere nearby. I could do a million things while still catching up with my people. As time went by though, I saw things about my beloved Bluetooth that could be so much better. For one, the ear piece was too hard and hurt my ear to the point of slight bruising. There were times also that I wanted to switch it to the other ear but the mechanism was weak so the handle eventually broke. My MacGyver side kicked in along with Krazy Glue and I fixed that problem – momentarily! As the nuisance of bruising and my wanting to switch it from ear to ear grew. I realised it would be better if they made the ear piece softer. Furthermore, they could create a swivel mechanism for the hook, lessening the chances weakening and breaking. Brilliant! I am Brilliant! I could write Samsung and let them know of my brilliant discovery but first I’d look online for a replacement Bluetooth in the mean time. Well, to my sad discovery Plantronics had already coined my brilliant ideas and made the perfect Bluetooth at a very reasonable price. It had a soft landing for my inner ear and a swivel hook that I could switch over from ear to ear very easily. It reminds me of the time I thought of using spandex type material under dresses. Then Spanx came out and I started feeling like some greater force was in my head stealing all my ideas. I’ve since owned three Plantronic Bluetooth devices. Besides the second one falling out of my ear into the abyss, the first one had its share of falls and hard hits and eventually stopped working. I’m on my 3rd one and it has taken the hardest of falls to where it completely broke apart. I put it back together like any longstanding relationship lol and it keeps on ticking. I’ve always wanted to share my experience with this product because of how well made it is and most especially the cost. The one I have is no longer available on Amazon but there’s an even cheaper version available. Besides the specific features of this device, just having a bluetooth connected to your phone when driving is a great idea. You can answer your calls, make calls and even read and respond to your texts with a press of a button and a few commands to Siri. If you’re not a tech savvy person like a few people I know, it might just take a bit of getting used to but once you get the hang of it, it will become an essential piece of equipment for your daily life. Don’t underestimate the power and freedom of a Bluetooth. Here’s a link to other products I’ve written about. Are people always transforming or is it just those of us brave enough to view ourselves from the outside? It feels like I constantly redefine who I am, how I see things, what’s true to me and what I choose to embrace or let go of. It never stops. One of the things that has transformed in a big way is how I eat which harnessed a new love for Trader Joe’s. I’ve grown to appreciate some of their products as top of the line, so much so I now have a list of a few of my favorite things from Trader Joe’s. In the last few months I found myself really becoming aware of where some of my food comes from. I started following a fellow named Luke Ireland on Facebook. I don’t even know how I found him – somehow he ended up on my newsfeed. It opened a world of information I had never paid attention to or perhaps was never exposed to. His posts even changed my views on zoos and Sea World. It’s all still a process but it has so far lead me to cut out meat from my diet for the last four weeks (January 22, 2018 more than year later now). Seeking new ways to eat and fill my tummy up besides frozen yogurt from Yogurt Land, has also lead me to seek out more organic food, specifically plant food. My quest now is to find new recipes so that I can feed myself and my 6 feet 3inch 15 year old son! 🙂 I’m willing to give it a try. Do you have any vegetarian recipes that are simple and easy for a veggie novice like me? Purchasing name brand items can be so overrated. When you’re on a budget, you tend to find more innovative ways to make your finances work. Sometimes that includes going to the “Dollar Store” , 99c Store or more specifically, Dollar Tree. At first, I was skeptical figuring the things in the Dollar store can’t possibly be of much use or if so, not for very long. However, I was surprised. There’s no easier way to satisfy a need than when you really have one. In this case, my need was budget shopping tips. Exfoliating bath gloves can be found at other higher end stores like Target or Walmart for upwards of $3.99. You can get the same experience from the bath gloves at Dollar Tree for only $1 plus tax. If you’re changing these gloves every few weeks or so, you will be looking at a significant savings over the period of 52 weeks. If you’re looking for a simple extension cord in your home for basic items like lamps, fans etc, it would make more sense to spend $1 on a 6′ extension cord. It will do the same job as a 9′ foot extension cord found at Target ranging anywhere from $2.99 upwards. I don’t know about you but I’m probably a bit rough when I’m blow drying my hair and the power cord always wiggles its way out of the outlet. $1 extension cord solves that for me, instantly. These can be found at department stores for prices upwards of $10.00. You’ll find the generic brand for $1.00 plus tax at Dollar Tree. These tests are just as good and provide same accurate results, for the most part. Even if you search blogs or YouTube videos online, you will find many people who will testify to their accuracy. A similar test proved my bouncing baby boy many years ago! Sometimes, you really have to subscribe to the notion of “Don’t believe the hype!”. If you’re planning to organize your fruits and veggies, the cheapest way to gather new Tupperware is from Dollar Tree. While they have a range to choose from, you will also find Rubbermaid brand which is an excellent choice. And, if you’re looking for something fairly durable but that you don’t mind losing, there are options for some more generic brands also. $1.00 will get you a set of two or three microfiber dish clothes which work really well. The quality of the cloths are so good and you don’t think twice when it’s time to change them since their cost is simply $1! Prescription glasses were quite a bit out of my price range recently. When I found myself squinting and creating a sharp line in the middle of my brow from doing so, I knew I had to find a solution. There are so many different styles and grades to choose from. The good part is, until you can get better glasses, you don’t mind if you end up losing or trampling over these because they only cost a dollar. If you like to keep it simple or your budget is tight, especially for children who outgrow their shoes within months, this might be something to consider. There are usually a wide variety to choose from and works good either as a hold over until you can get what you really want or until your child outgrows the shoes he or she is wearing now. Most gift bags are tossed aside or reused. You’re basically tossing away $5.00 to $10.00 each time you give a gift and purchase your gift bag from a department store. At Dollar Tree, there are various sizes, colors and styles to choose from, including the paper to go inside the bag to give it a little more pizzazz. Please think about it before you wrap and waste! While I’ve always bought flossers from Dollar Tree, I recently discovered the Plackers Right Angle pack. It has a fold away protected pick which gives you even more leverage to clean your teeth and the floss is laced with mint so your teeth get a sense of freshness while you clean. $1 each gives you a wide variety of hair pins, holders and clips. Once again, comparing them to department store prices and at the rate these things tend to disappear, it’s definitely a more sound decision to go the Dollar Tree way. I was first introduced to Awesome Spray cleaner when I bought my first used stove and refrigerator. They both came with a few dents and loads of dirt. My cousin told me the best bet was Awesome Spray. It’s very strong in terms of fumes so please keep that in mind when you use it, expecially if you are going to use it indoors. The good news is though, that as strong as the smell is, it is even more potent and you will be amazed. It truly is “Awesome” Spray. I love socks from Dollar Tree. There are a variety of colors and styles to choose from and I’ve yet to be disappointed in a chosen pair. As I write this, however, I wonder if I just haven’t experienced a higher quality sock so I simply don’t know better. You can’t go wrong with the hand soap here, unless of course, there happens to be a great sale happening somewhere else, like those awesome sales from Bath & Body Works! In the mean time though, $1 for a bottle of hand soap is definitely not a bad investment especially if you have kids, a large family or always entertaining people at your house. $1 gets you a handy little flashlight, complete with batteries. This is perfect if you want to read late at night without a lamp on. The clip on feature is perfect for almost any object – a phone, a book, some papers, a clipboard… pretty versatile. I’m sure as time goes by, my list will have increased. I feel like every time I go to Dollar Tree, I discover something new. Please let me know if you have a favourite item from the dollar store that’s not listed here! I’d love to try it. Since I got really into Yoga this year, I decided I wanted to document my journey. This would include photos and videos and all kinds of fancy sayings that promote wellness, goodness and loving life. 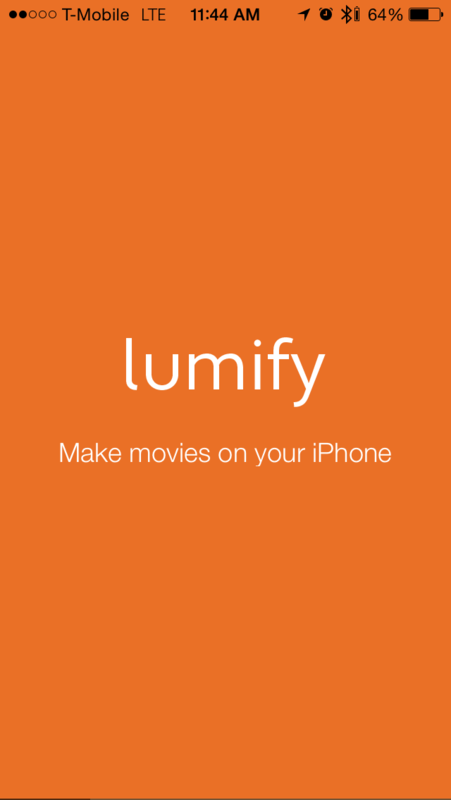 I searched and found this app called Lumify for iPhone. Best video app in my experience. To the best of my knowledge, it only works on iOS platforms. I absolutely love it. It’s not just that it visually engages me as an artist but it is so user friendly and fast. It has some neat lil transitions and adding music is easy. It allows for addition of several scenes and then seamlessly melting them into one boiling vision of perfection. There are options to slow down your video, speed it up, keep the original audio or have it subdued in the background. When adding your music, it is possible to have more than one song play in your video for different scenes and at any sound level you so desire. You can select how fast you want your video to go or even create slow motion. The filters are great as well as special features such as slow motion, zoom etc. The only issues I had with this app is that it can only speed up a video 2x. Sometimes it would not be enough if I wanted to create a certain feel for my video of if I wanted to complete a full Sun Salutation in a 15 second segment for Instagram videos, especially when doing Astanga Yoga. I saw another app called Viva Video online and it could speed up a video 4x so I resorted to using that when needed. 1. Record and insert your video and set speed up to 2x. 2. Save your video to your phone. 3. 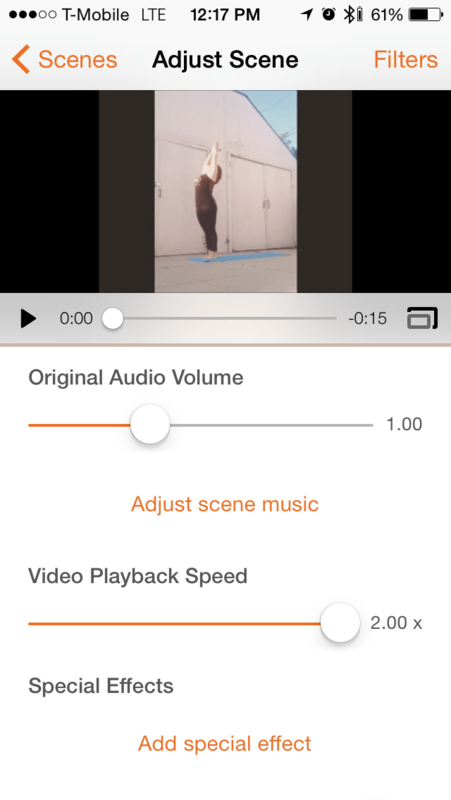 Reopen that same video in Lumify and set speed up to 4x. 4. Add music if desired. I am so appreciative of the makers of Lumify – not only does it work like a gem but it’s visually appealing. I have made use of Lumify mostly making Instagram Videos but it can do so much more. I’ve used it to assist my son with Homework videos specifically. Also, I have made some neat Birthday Greeting videos and Memorial videos, honoring people who have passed on for friends and family. Oh, to continuously seek and find all that can NourishMeSweetly is complete and thorough bliss. Lumify, you certainly do NourishMeSweetly.